Exhaust smoke is a way of your car communicating with you to say what is wrong. Usually, the smoke that get emitted is black, white, grey and blue. The exhaust gases is an old school way to detect symptoms of problems i.e. large amounts of black smoke may mean the EGR is blocked and its over fueling. Knowing the difference between the smoke that comes from the exhaust is very useful. If you are not going to fix the car yourself, take note when the smoke appears and the color and report back to your mechanic. Avoiding the problem will only shorten the life of the engine and result in unnecessary repair bills. This article will cover the different smokes that appear for different fuels. This will hopefully put your mind at ease and give you an idea of what your car is trying to tell you. 1 Why is Blue or White Smoke Coming out of my Exhaust? 2 Why is Black Smoke Coming out of my Exhaust? Why is Blue or White Smoke Coming out of my Exhaust? White smoke has a varying amount of causes and symptoms, which are more common in gasoline cars. The most common cause of white smoke is when the car has just been started. Do not be worried about this, the white smoke is just steam from condensation that clears as the car warms up. In my experience, thinner or clearer white smoke is not something that causes me to take action. However, if the smoke is thick and usually smelly, I will be looking for the route cause as soon as possible. A common issue with cars that have been neglected or simply the gasket has reached the end of its lifespan. Try using a head gasket sealer and testing to see if any smoke appears and you would have located the issue. The turbo usually emits white or grey smoke that mostly appears under acceleration. Not as common but seals and pumps do fail and turbos problems get worse with old age. Mixed with a blueish smoke and a distinctive smells, burning oil is emitted through the exhaust. Some Causes such as bad valve guide seals, piston rings or PCV and more. Always where possible use full synthetic motor oil when changing your oil. In some cases, certain engines tend to bellow out white smoke when they are too hot. Check the temperature next time there is white smoke. If its overheating, look into potential causes, such as broken fans or no water. Not that common but a cracked engine block will force white smoke to the exhaust. This sort of damage to the block can cause a car to become written off by the insurance companies. The seals on the fuel injectors are prone to breaking down and eventually leak. This can cause a blueish/white smoke to bellow from the exhaust. Take a look on your engine bay to see if there are any signs of leakage, usually in the form of black carbon build up. Often poor quality fuel can cause a blueish mix of white smoke to emit from the exhaust. Its always best to use diesel fuel cleaner to treat your diesel fuel. Why is Black Smoke Coming out of my Exhaust? Black smoke that gets emitted from a car is more common in diesel cars. 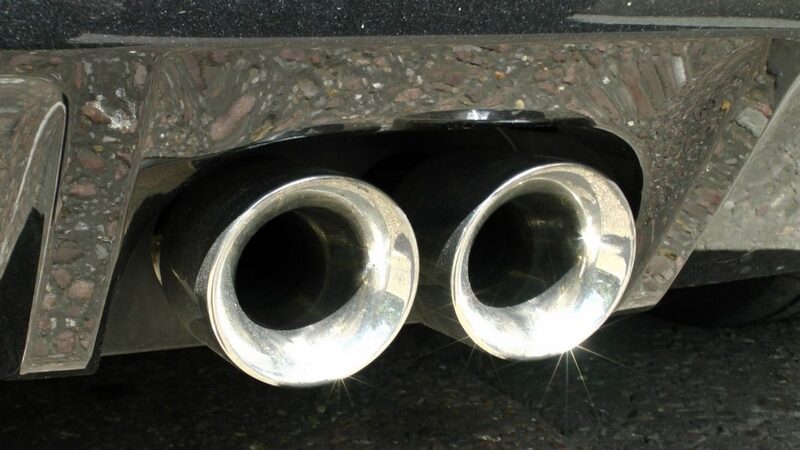 Apart from when the car is cold, white smoke should never appear from a diesel car exhaust. The majority of older diesel cars will bellow black smoke under heavy acceleration but new diesels will not emit any black smoke. Black smoke in petrol/gasoline cars will is often the result of a rich mixture from the distributor. This will results in very poor miles per gallon and extra stress on engine components. A rich fuel mixture or air mixture will cause black smoke under acceleration or revving. This can be a result of a distributor unit providing too much fuel to the injectors or not enough air getting to the fuel. Some cars are tuned to run rich such as the Mitsubishi Evo. A clogged air filter or not enough air getting to the cold air intake system completely offsets the air to fuel ratio. Over Fueling or ECU Chip/Tuning/Remap. The term basically means that too much diesel is being pumped from the fuel pump. This has the potential to crack a cylinder head if its over fueling excessively. However, if the diesel car has been tuned or remapped, over fueling (and over boosting) is common. I had a 1.9 TDi that was remapped, which would leave a black smoke screen in my rear mirror under heavy acceleration. Faulty Turbocharger and Bad Air to Fuel Ratio. Diesel fuel requires an adequate air ratio in order to perform as it should from the factory. The poor ratio is usually caused through a faulty turbo, dirty/old air filter and sensors that control air flow. With a bad air to fuel ratio, performance will be reduced significantly. Sticking Swirl Flaps, Blocked EGR and Inlet Manifold. Swirl flaps that are locked in place will usually cause the blockage of the EGR (Exhaust Gas Recirculation) and the inlet manifold. Not only will this block air passing through, it also causes a large black carbon build up that effect the performance massively. With the components blocked, any sort of acceleration causes large cloud of black smoke to exit the exhaust (I have experienced this plenty of times!). Poor quality fuel will also cause black smoke (as well as white) to come from the exhaust. Using a diesel additive to clean vital components can fix this problem, which we recommend to do on a full tank basis. My car(volkwagen vento) brings out black smoke, jerk and stall. What could be the cause? My vehicle is a Vauxhall Omega 1995. Has white smoke after startup. No water loss. Only started doing this after cat was changed. New cat is smaller than original one. Takes about 30 min of driving for smoke to stop. Just lots of water comes out. No power problems.